Home Workouts 19 Best Dumbbell Exercises For Shoulder ! 19 Best Dumbbell Exercises For Shoulder ! 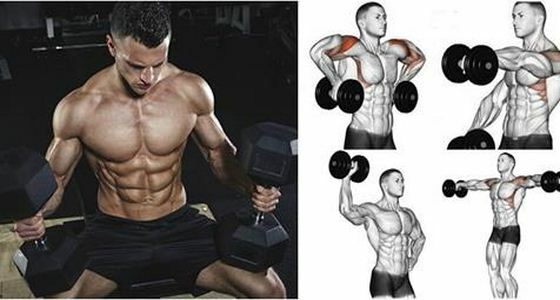 Dumbbell exercises for shoulders target the inner, outer and rear deltoid muscles as well as the trapezius. Stand up and hold two dumbbells at shoulder level, palms facing each other. Push the dumbbells straight up until your elbows come close to locking and lower them back down after a short pause. Be careful NOT to jerk your back in an effort to help you raise the dumbbells. Sit on a bench (or chair) and hold two dumbbells at shoulder level, palms facing each other. Stand up and hold two dumbbells, one at shoulder level and the other high with your arm extended, palms facing each other. Push one dumbbell straight up until your elbow comes close to locking and lower it back down after a short pause. Alternate hands. Sit on a bench and hold two dumbbells, one at shoulder level and the other high with your arm extended, palms facing each other. Stand up and hold two dumbbells close to your shoulders, palms facing forward. Raise the dumbbells straight up until your elbows come close to locking and lower them back after a short pause. Sit on a bench and hold two dumbbells at shoulder level, palms facing forward. Sit on a bench with support for you back and hold two dumbbells at shoulder level, palms facing each other. Raise the dumbbells straight up until your elbows come close to locking and lower them back down after a short pause. Stand up and hold one dumbbell with each hand in front of your hips, palms facing each other. Raise the dumbbells to your sides until your arms are close to being parallel to the ground and lower them back down after a short pause. Try to maintain the angles in your elbows still throughout. Bend down and hold one dumbbell with one hand between your legs, knees slightly bent. Raise the dumbbell to your side until your arm is parallel to the ground and lower it back down slowly after a short pause. Sit on one end of the bench and hold one dumbbell with each hand down the side of your body. Raise both dumbbells sideways until your arms are parallel to the ground and lower them back down slowly after a short pause. Sit on one end of the bench and lower your body as to hold one dumbbell in each hand just below the floor. Raise both dumbbells to your sides until your arms are close to being parallel to the ground and lower them back down slowly after a short pause. Maintain the same small arch in your elbows throughout. Lie down on a high bench (face down) and one dumbbell on each hand below your chest, arms slightly bent. Lie down on your chest on a bench and hold one dumbbell in each hand on each side of your hips, arms slightly arched. Bring both dumbbells forward until you can see both at the same time and bring them backwards slowly after a short pause. Maintain the same small arch in your elbows and keep both dumbbells at the same height from the floor throughout. Stand up and hold one dumbbell in each hand in front of your thighs. Raise the dumbbells to your shoulder level and continue on to raising them up at arms’ length and lower them back down slowly after a pause. Keep your arms extended throughout. Raise both dumbbells until your arms are parallel to the ground and lower them back down slowly after a short pause. Stand up and hold one dumbbell with each hand in front of your thighs, palms facing your body. Raise the dumbbells forward then up until your arms are close to being parallel to the ground and lower them back down after a short pause. Raise the dumbbells straight up by raising your shoulders and lower them back after a short pause. Stand up and hold two dumbbells just above your shoulders, palms facing each other, knees arched. Push the dumbbells straight up until your arms are close to locking and lower them back down slowly after a short pause. Breathe out when pushing up and breathe in when lowering back. Crouch by bending your hips and knees and hold one dumbbell with each hand close to your knees, palms facing backwards. Raise the dumbbells straight up until your elbows form a 90 degree angle and lower them back down after a short pause. Try to focus on only moving your arms during the exercise. All Exercises 4-5 Sets/ 12-15 Reps/ 1 Min Rest Between Sets !! !